What are the benefits of LED globes and Incandescent Globes? 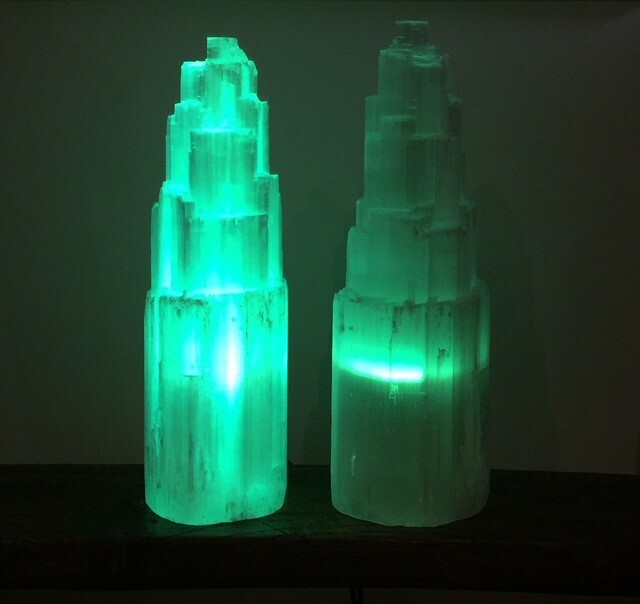 In this article, we’re referring to how LED globes and incandescent globes work with selenite lamps and rock salt lamps. There are many advantages in using LED globes – LED globes produce light at significantly lower running temperatures than traditional globes, which makes them more economical and longer lasting. 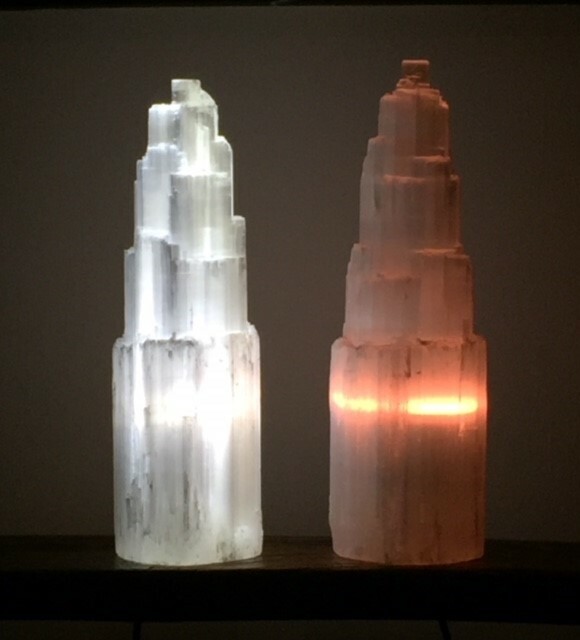 LED globes look stunning in a selenite lamp, giving the lamp a more even toned and brilliant, almost ethereal glow. LED globes have a life of up to 30,000 hours. In these photos (both taken in a dimly lit room, enjoying the ambient lighting provided by the selenite lamps) we have LED globes on the left hand side and incandescent globes on the right hand side. You’ll notice that we have used a ‘cool’ clear LED globe on the left hand side, which is distinctly opposite to the ‘warm’ clear globe that is apparent from the incandescent globe on the right hand side (please note that lighting makes a huge difference and, in real life, the selenite lamp on the right with the clear globe is not as ‘warm’ as it appears in the photo, however the two globes project a totally different effect). Incandescent globes use a filament to heat up, which makes them the ideal globe to use in rock salt lamps. 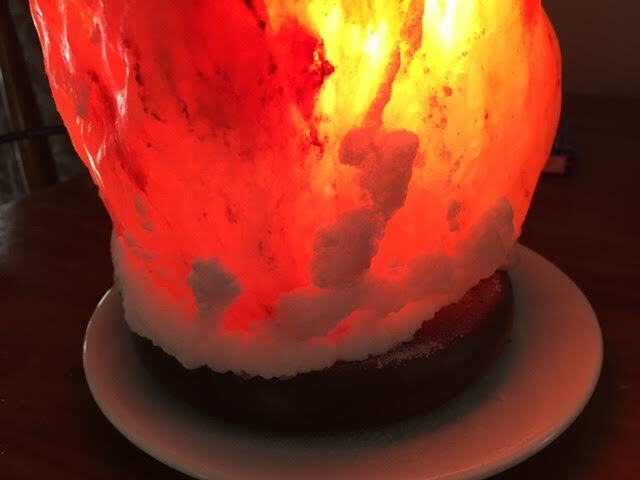 Rock salt is hygroscopic, which means it absorbs moisture from the air, and the moisture that is attracted to the rock salt lamp will ‘weep’ or ‘leak’ if there is no heat from the globe absorbing that moisture. Incandescent globes have a life of up to 1000 hours. The example below shows a salt lamp that had been switched off for some time (ie no incandescent globe warming the salt lamp), and the moisture that was attracted to the salt lamp “leaked” down the salt lamp and pooled at the bottom, giving the ‘bubbling’ salt residue that is evident. The same effect would be experienced should an LED globe be used in a salt lamp, as ‘real’ heat is not generated by LED globes. incandescent globes for salt lamps (warm lighting) that help create the lovely calming energy and ambience we all love in salt lamps. Great suggestions. I like using a led in a salt lamp as it is really strong light – but yes it doesn’t actually trigger the therapeutic benefits either. So will go back to incandescent I guess. Thanks for clearing this up for me. That’s great Bren. Thanks so much for your feedback!